Joseph Szigeti was a Hungarian violinist born on September 5, 1892 (Stravinsky was ten years old.) He has never been one of my favorites, though he has been praised by many famous violinists and musicians. It has been said many times that his tone left something to be desired, and that his playing seldom seemed effortless, although his interpretations seemed to have been well thought out, cerebral and intellectual exercises. He began his studies at the age of six but eventually ended up at the Franz Liszt Academy in Budapest under the tutelage of Jeno Hubay. He began playing many concerts in public while still studying and actually made his Berlin debut at age thirteen. In his late teens, he met Busoni (the piano player), who almost instantly became a great musical influence on him. Somewhat coincidentally, a little later on, while recuperating at a hospital in Geneva, he met Bela Bartok, with whom he remained friends until the end of Bartok's life (1945). 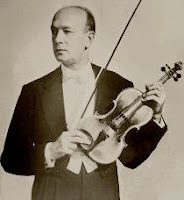 In 1917, he was appointed violin teacher at the Geneva Conservatory of Music. He married around that same time (1919) - he and his wife settled in the United States in 1940, but returned to Geneva in 1960. Szigeti retired from playing that same year but continued to teach. He published his violin method book (whom nobody uses any more) in 1969. There are many recordings by him of standard and not so standard pieces in the violin repertoire. You Tube also has several videos of his playing. He appears to have been a pedantic teacher and tutor, focusing much attention on minute details of playing. He died in Geneva, Switzerland on February 19, 1973, at age 80. Do you consider all of his interpretations to be "cerebral exercises"? How about (to name just two) his pre-war Brahms Concerto or Prokofiev First Violin Concerto? Szigeti never published a method book, where did you read that? Clearly, you just don't like his playing, which is fine, to each their own, but you seem to repeat what others have said rather than expressing your own views and conclusions.